Visual Studio Code>Programming Languages>Checkstyle for JavaNew to Visual Studio Code? Get it now. Check your Java code format and fix it! Note: Start from 1.0.0, the extension is not back compatible with the previous version (before 0.5.2). Click here if you want to check the previous documents. To set the configuration file, Just Right click the .xml file and select Set the Checkstyle Configuration File. When opening or saving a Java file, the extension will check the file format and provide quick fixes if possible. You can click the button in the editor to show the available quick fixes. 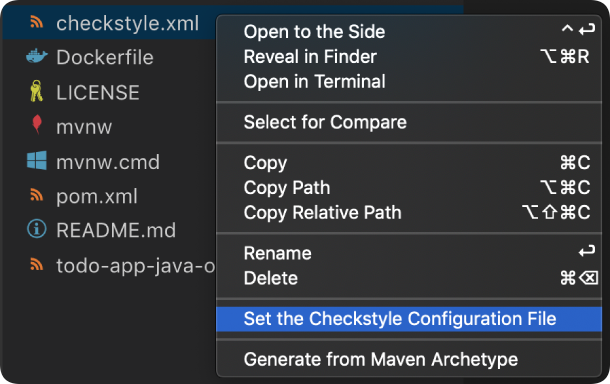 java.checkstyle.configuration Specify the path of the Checkstyle configuration file. ""